Strict sanitation procedures are behind the fun decor at Laque Nail Bar, with locations in North Hollywood and Beverly Hills, California. With budget nail salons in virtually every strip mall in towns, big or small, it’s become increasingly harder for salons and spas to compete on price alone in the nail arena. Amber Edwards, nail director for Mario Tricoci, with 14 locations in the greater Chicagoland area, says that the salon chain doesn’t even try. 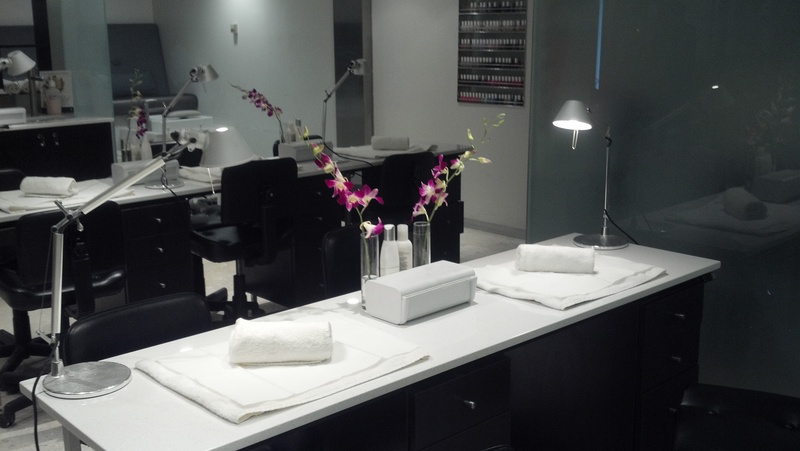 For most upscale salons and spas, offering upgraded services steeped in the latest trends and performed with the strictest sanitation practices is the smartest way to keep nail departments thriving. To keep services consistent across the 12 Mario Tricoci locations with nail departments, Edwards says it comes to constant education. All new nail technicians go through a three-week intensive education program, and exacting protocols are followed for each service on the menu, so a service is mirrored at every location no matter who performs it. The nail department in one of the Mario Tricoci locations. The chain features a number of enhanced nail services, including the current Organic Signature Manicure and Pedicure, the ultra-hydrating Moroccan Oil Manicure and Pedicure, and the indulgent Tuscan Pear and Olive Manicure and Pedicure. Because Edwards is responsible for about 150 nail technicians across multiple locations, she puts that same kind of careful examination into the creation and testing of new menu service offerings. She starts by personally testing new products, then investigating the manufacturing company. If a new product passes that phase, Edwards gives it to her seven lead nail technicians for three months of testing in several different locations. “Typically, the first month, the team will love it; the second month, they hate it; and the third month, you really get the best feedback if something is a prospect or not,” she says. If a product or service gets a green light, Edwards develops a training program and a marketing campaign to support the rollout of the new service. “Rolling out a new product is a bit quicker, but developing and rolling out a new service can take up to six months,” she says. New menus are introduced at Mario Tricoci about twice a year, but Edwards also plans seasonal manicure and pedicure specials that keep things fresh for regular clients. An important part of each consultation is an assessment of that client’s needs and a suggestion of applicable upgraded nail services, for instance a nail reparative service. Basic manicures are currently priced at $26, upgraded manicures at $39, and no-chip, cured polish services at $49. “Our technicians really love having the upgrade options—it gives them more to talk about with clients and more ways to help them with their needs,” Edwards says. Mario Tricoci keeps the creativity level strong through regularly hosted nail art contests. In 2012, lawyer Robert Torosian drove his wife Marina to her nail appointment, and instead of sitting in the car and waiting like he typically did, he came in and observed what all the fuss was about. He watched the technicians in the shop reuse pumice stones and alcohol wipes. Afterward, he started researching California sanitation regulations, and the couple started talking about opening their own nail salon. They started by visiting nearly 400 salons in and around Los Angeles and discovered that many weren’t following sanitation requirements. Determined to deliver an upscale experience and quality services that were accessible to all clients, the couple opened Laque Nail Bar in the more affordable North Hollywood area. “Our entire concept is built on sanitation, with a very clean space, well-trained technicians and cutting-edge nail art,” Torosian says. The couple carefully train all incoming employees in their strict procedures, monitor new hires for a couple of months and even watch them on surveillance cameras. The couple are so committed to sanitation, they’re working with the California State Board of Cosmetology to define, increase and enforce sanitation standards. Torosian has made sanitation a marketing point of difference for Laque. He frequently educates clients on requirements and even designs a sanitation post for Snapchat, Instagram and Facebook once a week. Now, clients bring in pictures and videos from other salons that aren’t following practices. The couple’s strict focus has paid off. They opened a second location in Beverly Hills, have 67 nail technicians on staff and are booked solid for months. Laque turns away 30-50 walk-ins per day and usually have clients lining up at 6 a.m. to snag any cancellations. With a winning concept in hand, the Torosians now are making plans to franchise Laque.